Object Lesson: A FUN Way to Share the Easter Story with Your Ministry! Editor’s Note: Check out this Easter lesson plan from our friend, Corinne Noble! On Good Friday we talked about how sin entered the world way back at the beginning, in Genesis 3 with Adam and Eve. Adam and Eve allowed temptation to get the best of them and they ate fruit from the only tree God had forbidden them to eat from. Ever since then, we all have sin in our lives. Romans 3:23 says, “For everyone has sinned; we all fall short of God’s glorious standard.” Hold up black slime. Jesus, who was perfect and completely without sin, took all of our sins on Himself on the cross. Hold up black slime in hand and allow it to cover your hand. Show cross picture with all the sins written on it from Friday night. Jesus became the ultimate sacrifice for all of us when he gave His life and shed His innocent blood on the cross. Hold up the red slime. Did Jesus deserve to die? Allow kids to respond. Who deserved it? Allow kids to respond. All of us. Romans 6:23 says, “For the wages of sin is death, but the free gift of God is eternal life through Christ Jesus our Lord.” So, Jesus died on the cross. Let’s imagine for a moment what it must have been like the weekend that Jesus was dead, for his disciples and followers. Jesus had told them himself multiple times that he would have to die, but that he would come back to life on the third day. Matthew 16:21 says, “From then on Jesus began to tell his disciples plainly that it was necessary for him to go to Jerusalem, and that he would suffer many terrible things at the hands of the elders, the leading priests, and the teachers of religious law. He would be killed, but on the third day he would be raised from the dead.” However, many of them seemed to have forgotten that. The resurrection proves that Jesus had the POWER to forgive our sins, and the power to defeat death. Add glue and water to another bowl, and combine both bowls. Show the kids how the mixture instantly changes. Romans 6:9 says, “We are sure of this because Christ was raised from the dead, and he will never die again. Death no longer has any power over him.” Jesus instantly changed the game for all of us when rose from the dead. He showed that He has the power to defeat death for all of us as well. Once Jesus had come back from the dead, He didn’t need to stay on the Earth for much longer. He went around revealing Himself to some of his closest disciples and about 500 others so there would be people to spread the news that He truly was alive. After about 40 days it was time for Him to go back to Heaven. Mark 16:19 says, “When the Lord Jesus had finished talking with them, he was taken up into heaven and sat down in the place of honor at God’s right hand.” Add gold paint to slime mixture. Jesus made the way for each of us to join Him in the place He has prepared for us in Heaven through His death and resurrection. We have the choice to believe in Him and follow Him or not. Offer a prayer of salvation/altar call if desired. On Easter Sunday, each kid went home with an easter egg filled with gold slime to remind them of Jesus’ resurrection. Combine borax and hot tap water. This slime recipe produces the ideal, runny goop. Begin by retrieving a mixing bowl, a teaspoon, and a measuring cup. Measure 1 teaspoon borax. Pour the borax into the mixing bowl. Measure 1 ⅓ cups hot tap water. Pour the water into the mixing bowl. Mix the water and borax together with a spoon. Mix thoroughly. Combine white school glue, hot tap water, and food coloring/paint. Retrieve a second mixing bowl. Measure 2 cups white school glue. Place the glue into the mixing bowl. Measure 1 ½ cup hot tap water. Add the water to the bowl. Add 3 to 5 drops of food coloring/paint. Stir the contents together. Make sure to mix thoroughly. Combine the two sets of ingredients and store. Pour the borax mixture into the mixing bowl containing the glue mixture. Stir for several minutes until you achieve the desired consistency—when you hold the spoon above the bowl, the slime should slowly drip off. If the color is not quite right, add 1 to 3 more drops of food coloring. 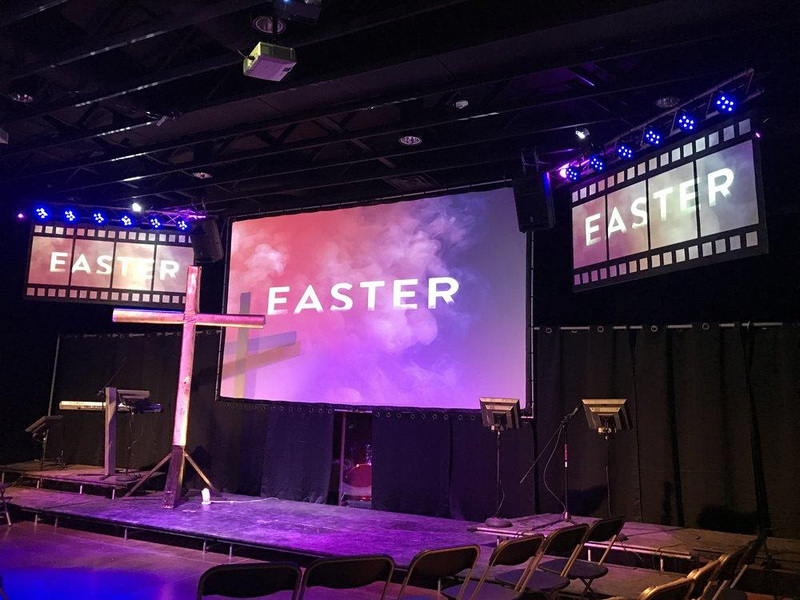 I hope this object lesson will help out other leaders who are looking for a new way to share the Easter story in their ministries this year. What are you doing this Easter to teach your kids and get them excited about coming to church?